FORD, Gerald Rudolph, Jr., a Representative from Michigan, Vice President, and thirty-eighth President of the United States; born in Omaha, Douglas County, Nebr., July 14, 1913; moved to Grand Rapids, Mich., 1914 and attended the public schools; graduated, University of Michigan at Ann Arbor, Mich., 1935; graduated from Yale University Law School, New Haven, Conn., 1941; admitted to the bar in 1941; served in the United States Navy 1942-1946; elected as a Republican to the Eighty-first Congress; reelected to the twelve succeeding Congresses and served from January 3, 1949, until his resignation from the United States House of Representatives December 6, 1973, to become the fortieth Vice President of the United States; minority leader (Eighty-ninth through Ninety-third Congresses); first Vice President to be nominated by the President and confirmed by the Congress pursuant to the twenty-fifth amendment to the Constitution of the United States; sworn in as the thirty-eighth President of the United States, August 9, 1974, when President Richard M. Nixon resigned, and served until January 20, 1977; unsuccessful candidate for election in 1976; died on December 26, 2006, in Rancho Mirage, Calif.; lay in state in the Capitol Rotunda, December 30, 2006, to January 2, 2007; interment at the Gerald R. Ford Presidential Museum and Library, Grand Rapids, Mich.
Papers: 1941-1975, 1 foot. Papers relating to Gerald Ford's service in the United States Navy. Scrapbooks: 1929-1978, 26 feet and 73 volumes. Includes scrapbooks documenting Gerald Ford, his family, and later his staff. The scrapbooks primarily include newspaper and magazine articles, programs, invitation, newsletters, memorabilia, and some correspondence. Papers: Congressional Papers,1948-1973, 921 feet. Congressional papers documenting Gerald Ford's campaigns, voting record, bill sponsorship, speeches, and press release releases. Includes Gerald Ford's work on House committees from 1948-1965. 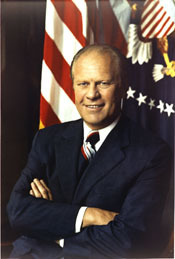 Gerald Ford's subsequent role as work as Minority Leader is not extensively documented except for his membership on the President's Commission on the Assassination of President Kennedy (Warren Commission). Papers: Vice-Presidential Papers, 1973-1974, 105 feet. These papers document Gerald Ford's role as Vice-President under President Nixon. There are some materials from Gerald Ford's congressional service which was gathered to use in his confirmation hearings. Includes materials on the Vice-Presidential confirmation, material on domestic and foreign policy issues, scheduling, travel, constituent case work, and public opinion mail. Material on the Watergate affair and relations with the Nixon White House are limited, as well as material on the Presidential transition. Papers: Presidential Papers, 1974-1977, approximately 750 linear feet. This includes the White House Central Files Subject File. The subject file includes nearly everything associated with the Gerald Ford Administration. Papers: Photocopies from other Presidential libraries, 1949-1968, 1 linear foot. The Ford Library has acquired photocopies of miscellaneous related items at other presidential libraries. Limited searches in obvious file locations yielded these miscellaneous materials about Gerald Ford in the Truman, Eisenhower, and Johnson Libraries, and in the Nixon Presidential Materials Project. Included are tape recordings and transcripts of telephone and other conversations by President Johnson concerning the Warren Commission and the assassination of President Kennedy. Papers: Material from the writing of A Time to Heal, 1977-1979, 15 feet. Includes Gerald Ford's handwritten reflections (42 pages) on twenty-seven topics. Gerald Ford prepared these at the request of Trevor Armbrister, a journalist who assisted in the research and writing of A Time to Heal. The bulk of this collections, which includes no White House-era files, is unavailable for research. Cannon, James. Time and Chance: Gerald Ford's Appointment with History. New York: Harper Collins, 1994. DeFrank, Thomas M. Write It When I'm Gone: Remarkable Off-the-Record Conversations with Gerald R. Ford. New York: G.P. Putnam's Sons, 2007. Firestone, Bernard J., and Alexej Ugrinsky, eds. Gerald R. Ford and the Politics of Post-Watergate America. 2 vols. Westport, CT: Greenwood Press, 1993. Ford, Gerald R. A Time To Heal: The Autobiography of Gerald R. Ford. New York: Harper and Row, 1979. Ralph Nader Congress Project. Citizens Look at Congress: Gerald R. Ford, Republican Representative from Michigan. Washington, D. C.: Grossman Publishers, 1972. TerHorst, Jerald F. Gerald Ford and the Future of the Presidency. New York: The Third Press, 1974. Unsworth, Michael E. "'The Best Officer of the Deck': Gerald R. Ford's World War II Experience." Michigan History 78 (January/February 1994): 8-14. Personal memories of Minority Leader Gerald Ford of Michigan.